Of the three Crunchy Nut cereals that Kellogg's introduced in the U.S., this one ranks right in the middle. The best variety is Golden Honey Nut Crunchy Nut Flakes. My least favorite was Roasted Nut & Honey Crunchy Nut O's. This new variety delivers on the flavors promised by its name. It's crunchy and stays that way for up to 4 minutes in milk. It's nutty. You get the flavor of roasted peanuts in every bit. Caramel makes a big impact. It's not only noticeable in the flakes, but after a minute the milk become caramel colored and the whole bowl becomes a caramel extravaganza. One drawback: The caramel flavor has a slightly burnt undertone. It becomes less noticeable the more you eat, so trudge through a couple spoonfuls before you cast your final judgement. It's definitely a sweet cereal. I know a lot of people will find it too sweet. Personally, I was okay with it. However, it struck me that one more single granule of sugar could drive this into the overly-sweet category. All in all, this is a pretty good cereal. If you're into the flavors of caramel and peanuts, I'd put Caramel Nut Crunchy Nut on your shopping list. But I'd also put some beans and broccoli on that list because you're going to need some dietary fiber. This cereal has absolutely none. Nutritional Considerations: Each 3/4 cup serving of this cereal has 120 calories, 1 gram total fat (0 saturated and 0 trans), 0mg cholesterol, 25 grams total carbs, 0 grams dietary fiber, 10 grams sugar and 2 grams protein. 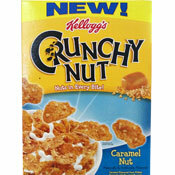 What do you think of Caramel Nut Crunchy Nut? I'm a huge caramel fan, and original preferred this version, but now I think I actually prefer the "basic" Honey Nut Crunch flakes. The caramel one has more of a caramel "smell/essence" rather than actual caramel flavor, if that makes sense. If you're a "more than 1 bowl" cereal-eater, it's almost too strong--the less-intense Honey Nut version is better for "consuming mass quantities". 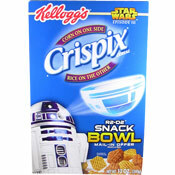 This cereal is so delicious, I'm tempted to pour myself two or three more bowls after eating one. Great caramel flavor!